Watch rare and extensive footage of Milwaukee Road 4-8-4 No. 261 at work in the winter when all the conditions to show you the drama of steam are at their best. As "Railfan Magazine" reported in their review, the 261 crew "...aligned the planets to permit five full days of excellent winter running...on the Pocono Mountain grades of the old Lackawanna Railroad." First, the 261 figuratively clears the line by pushing a wedge snowplow up the hill then performing runbys in falling snow. Then it's on to the passenger trains with beautiful scenes of steam in the sunshine and the snow. As a special surprise, Steamtown's ex-Canadian Pacific 4-6-2 No. 2317 was on hand to pull the train back to Scranton. The 261 also pulled a special photographer’s charter freight train for two days and we cover all of those runbys. Weather varies from bright, clear sunny days to classic winter scenes with new-fallen snow and even a little fog. We end with an engineer and fireman narrated runby as they explain how to run the locomotive for maximum photographic and sound effect. 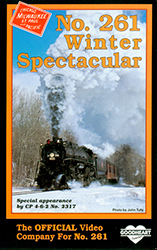 As the folks at "Railfan Magazine" said, "...Buy this video for the sheer joy of steam in the snow. The ice harvesting at Tobyhanna Lake with backlit steam running on a distant fill is a timeless image from early in this century and worth the price of admission."